There are many stories in Don Quixote, but perhaps not a single one so unbelievable as the story of its creator. Miguel de Cervantes didn’t have it easy. 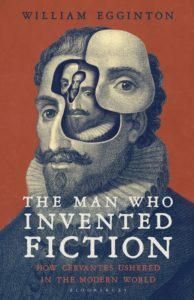 William Egginton’s new work, The Man Who Invented Fiction: How Cervantes Ushered in the Modern World (Bloomsbury, 2016), makes this abundantly clear. But Egginton’s book focuses on the ways in which Cervantes, with his literary talents and his time-tested sense of humor, persevered in a world that seems to have conspired to keep him down. Cervantes was no ordinary chap. He was a humanist in an age of inquisition. Somehow he kept his head. Who was this man? And how did his life inform his art? Egginton pursues these questions and presents his audience with enormously rich readings of Cervantes’ fictions while demonstrating how a man with a dream can overcome the limits imposed by reality. A.M. Davenport: Bill, how would you describe Don Quixote to an alien? William Egginton: This is a novel written by a deeply disillusioned soldier many years ago, about a deeply deluded soldier living in his own time. It’s about a friendship between two very different men who can’t quite see the world in the same way, and the love they feel for one another despite, or even because of those differences. And finally, it’s a novel about how sure we humans are about what we know to be true, how dreadfully wrong we can be, and how incredibly funny that fact is, once we can learn to see the truth of our situations. That’s such a good description. It’s a theme that you carry forth throughout your work: how we perceive our own and others’ lives. I’m reminded now of why I first took your book from the library. While I was looking over the cover, I realized how close Don Quixote is to me. I grew up with a large framed poster of the knight errant in my family’s living room. We also had a carved wooden sculpture of the knight. I’m interested to know how you think visual representations of the novel have contributed to its popularity over the centuries. Did we live in the same house? The iconography around Don Quixote seems to have been irresistible from the start. Already within a few years of the first publication effigies of the world’s first and greatest buddy road movie were popping up in parades, not only in Spain but in Germany, the Americas, and elsewhere. When the Romantics started founding their ideas of great literature on Cervantes in the 19th century, the imagery exploded. Doré’s woodcuts from the mid-19th century French edition are the most famous, but there are legions more, many from little-known artists around the world working in a variety of media. The set I have on my mantle, for instance, was made from oxidized iron by a Salvadoran artist. And the poster I grew up with was one now recognizable around the world—Picasso’s black and white sketch published in 1955 to mark the 50th anniversary of the book’s original publication. Your book includes a couple reproductions of illustrated DQs adapted for children. I wonder if you have a recommendation for an illustrated edition of the novel. Are there parts of Don Quixote that your children particularly enjoyed (if you read it to them)? I haven’t yet. While I talk about the fact that the book has been abridged and edited for children (indeed, it’s now appeared in a “translation” into modern Spanish in an effort to get more Spaniards to read it), I’m too much of a purist to give my kids diluted literature. The Quixote is a hilarious book, but it’s a serious read. I really think college is the right age for it, and think it should be well taught to better enhance the readers’ understanding. When I teach it to my undergraduates in the Great Books course at Hopkins, it is universally the most popular read, despite its length. 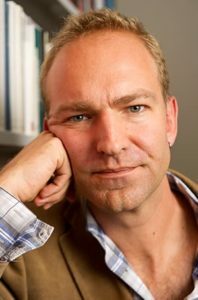 William Egginton is the Andrew W. Mellon Professor in the Humanities and Director of the Alexander Grass Humanities Institute at the Johns Hopkins University. His most recent book is The Man Who Invented Fiction: How Cervantes Ushered In the Modern World (2016). Were you in college when you first read the novel? And was it long before you came to realize that Cervantes wrote much, much more than “only” Don Quixote? Yes, I read it in college, but not well. Then again as I prepared to go to graduate school. But I really only started to grasp the genius of it when I began teaching it to undergrads and grads alike. That’s when I learned how much more there was to the book itself, and how much more Cervantes there was to read than Don Quixote. Over the years since then I’ve taught most of his works at one point or another, and they are always a joy and a rediscovery each time. Your new work does an excellent job of detailing Cervantes’ life. Would you describe some of the places Cervantes lived? What are some of the more interesting careers our author held? As much to his dismay as to our fortune, he lived for five years in captivity in the city of Algiers, then the slave trading capital of the Mediterranean—and he was on the wrong end of the slave-slaveholder relationship. It’s a miracle that he survived that time, and he endured almost unimaginable hardships. But it also gave him more experiences and knowledge of different kinds of humanity than he otherwise ever could have gleaned—without which the man who invented fiction, as I put it, might never have done so. Before that he lived for several years in Italy, which he deeply loved and which left a huge imprint on his writing as well. In Italy he joined the Papal forces as a soldier and fought against the Turkish Empire in the Catholic League’s most successful military endeavor, the naval battle of Lepanto. When he finally was ransomed from captivity in Africa and returned to Spain years later, he found it difficult to get by, and combined writing with undesirable jobs such as tax collection and requisitioning goods for the army. He landed in prison several times as well, though not for actual crimes. It was really only as an older man that he finally started to carve out a living as a writer, largely from the success of Don Quixote in 1605, although he was far from wealthy because of it. Tax collectors never go over well in any time period…I’m wondering if Cervantes is lucky or unlucky? Perhaps it’s silly to even suggest such a duality. But so much in his life went wrong. What do you find to be the most trying moments in Cervantes’ life? And what do you think he relied on to get him through those difficulties? I guess it depends on how you look at it. In some ways he could be considered unbelievably lucky. He survived the battle of Lepanto after being shot three times. He suffered infections and likely malaria in the hull of his ship and was delirious with fever for days on end. He fought pirates, and lost, before being dragged in chains to a dungeon of a city that spared very few of its captives, and yet he survived. Not only that, he organized four escape attempts, any one of which could have led to his execution, but his captors were so convinced he was worth more to them alive than dead that they spared his life each time. Again and again what we see in Cervantes is that his wit, intelligence and optimism stepped in to save him. No one that I can think of has made lemonade out of life’s lemons as sweetly as he did. His sense of humor, wry and ironic as it was, allowed him to laugh at his own misfortunes and see the humanity in others, no matter how different, and even when they were his enemies. These qualities not only saved his life, they helped create the extraordinary literary inheritance he left us. That’s precisely the lesson I took from your book. There’s quite a bit to learn from that tale. And there are so many men and women who are wrongfully convicted and imprisoned here in the States! So true. And there are few emotions that come through as strongly and consistently in Cervantes’ work as the love of and desire for freedom. He lived in a repressive society, but at the same time enjoyed a freedom of movement that was altogether new for his time and culture. His long periods of captivity, especially in Algiers but also in Spanish prisons, always on mistaken or trumped up charges, sharpened his appreciation of freedom. An Albanian friend once told me that, growing up under one of the most repressive communist regimes in Europe she and her friends were astonished that Don Quixote was not censored or banned like so much other literature, and they felt a thrill at reading it and knowing how personally it spoke to them about how regimes crush liberty by deciding what is real and what is not. But in our ostensibly democratic societies today are we not also prisoners? Do not the media’s gilded cages tell us what to desire, how to live our lives? Aren’t our apparent freedoms in the end quite tightly circumscribed? And, as you point out, don’t legions of the poor and disenfranchised languish beyond for-profit bars or abandoned towns and neighborhoods, neatly out of sight in our highly edited existences? It’s the imaginative qualities in Cervantes’ work that truly makes it sing. Don Quixote, whether he knows it or not, is motivated by a different way of perceiving the world. Steven Moore, who knows a thing or two about novels, writes that Don Quixote is the first book in which a literary character visits a bookstore. Do we know anything about the bookstores or libraries Cervantes frequented? We have a very good idea of which books were selling at the time, which books he himself had read, and what he thought about them. In fact, we may know more about that than almost any other aspect of his social life, simply because he included so much of it in his writing. Since fiction, as I argue in the book, is not just a picture of the world but rather a picture of how people picture the world, and how they can get it right and get it wrong, the books around him and how they pictured the world were very important themes for Cervantes. He also was deeply involved in literary circles at the time and had strong opinions about the skills and talents of his fellow writers (or lack thereof), as did they of him. Bookstores themselves were a booming business, as the spread of print technology was dovetailing with the growing desire for entertainment of an increasingly urban and literate population, and we should never forget that, by the end of his life, Cervantes’ livelihood was really centered on the world of books. He had his publisher and his printer, knew all the censors personally—and in at least one case well enough to pull off the famous joke we see in Don Quixote II, where it’s now obvious that the censor’s approval at the outset of the book was actually penned by Cervantes. Bill, you paint a pretty picture of Cervantes as a person. But as someone who has recently found himself unexpectedly living with a cat, I couldn’t help myself from obsessively noting the instances of animal cruelty in Don Quixote. Our knight errant comes close a couple times to felinicide. And he actually kills seven sheep in the novel. Should Cervantes’ friends have been worried about their man of letters? In fact, given the historical context and attitudes toward animals at the time, Cervantes seems to have had an unusual empathy for animals. Rocinante and Sancho’s donkey are almost characters in their own right in Don Quixote, and Cervantes later wrote much of his greatest novella in the voice of two dogs (The Dogs’ Colloquy, which I write about in the book). In the latter he steps into the paw prints, as it were, of his canine narrators and really tries to see the world through their eyes. But yes, in general it was a violent age, and certainly not one in which it would have behooved one to be a cat. An emergent concern or even controversy today is the extent to which virtual reality has gotten so “real” that gamers may suffer psychological damage akin to PTSD, or worse, after significant exposure. It seems that a necessary distance between the gamer’s world and the “fiction” of the game can be broken by the full sensory immersion of today’s technology. It strikes me as an interesting question to ask how Cervantes, who was so insightful about the effects of his own media environment, which mainly consisted of books and theater, would react to the challenges of today’s technologies. If that’s the question, WWCD? (What would Cervantes do? ), then my highly speculative answer is that he would turn the technology back on itself. He would learn to code in VR and then create VR environments that surreptitiously undermine the efficacy of their own immersive tactics. I would imagine him, for instance, constructing a VR world in which players construct and compare VR worlds, and are alternately taken in by them and then disabused of their illusions. Fictions like those created by Cervantes are always in a sense prophylactic; they inoculate us against the ever-present danger that the media we inhabit and come to know the world through will be coopted by the powerful to make us desire and act in ways that serve their interests, instead of our own. Andrew Mitchell Davenport is the Interviews Coeditor for Full Stop and an Editor at The Scofield.